I'm preparing two lectures on these works for the second half of this year; the first (July) will go from the early to middle period, and the second from the middle to late. That means there will be a bit of emphasis on the 'heroic' period. What I'm wanting to grasp is to what extent Beethoven thought 'symphonically' or 'orchestrally' in working his way through these sonatas - whether harmonically, developmentally, formally, coloristically or all of these - and how they influenced his compositions of the symphonies. Which particular sonatas are good exemplars of this? In "The Tempest" Op. 31/2 Beethoven's second movement suggests use of the timpani in this 'operatic' movement. There must be plenty of other examples of 'orchestration' in these sonatas. Belle wrote: What I'm wanting to grasp is to what extent Beethoven thought 'symphonically' or 'orchestrally' in working his way through these sonatas - whether harmonically, developmentally, formally, coloristically or all of these - and how they influenced his compositions of the symphonies. Beethoven does sometimes evoke other instruments in his piano writing, including the singing voice. In the Tempest Sonata, I'm guessing that you are referring to the passage after bar 16, the octave triplets in the left hand. This same rhythmic figure, in the lower strings, occurs in the first theme of the funeral march of the Eroica Symphony, and writing about the sonata Tovey calls it a "drum-figure" without specifying which drum. (I'd think the side drum rather than timpani, suitable for a march.) Another example is the slow movement of Sonata No. 12 mentioned above, the funeral march; in the trio, the piano evokes the sound of drum rolls and perhaps trumpet calls as suitable for such a ceremony. You've nailed the sonatas I was thinking about too!! Excellent comments. Thinking 'symphonically' I also mean structurally. Just as one example, he uses a Coda in his sonatas for dramatic effect and, of course, most notably in the 3rd Symphony. For me it's as though he's working through these ideas for his symphonies during the process of composing the piano sonatas; so diligently did he challenge and 'interrogate' the sonata form itself that it seems a natural consequence that we got the 9th symphony and those late string quartets in their unique form. The innovations and developments we hear and see in those sonatas we hear and see in the symphonies - and, of course, other compositions in sonata form like his largest chamber works and the last 2 piano concertos. Beethoven seemed to aim beyond the piano in search of a resonance not inherent to the instrument. The sonatas, many of them, were huge and unprecedented in scope and scale. The types of lengthy introductions to the sonatas is something you'd find in symphonies of Haydn and Mozart. And from the middle period, the Beethoven sonatas found the final movements as the centre of gravity just as is the case in the symphonies. There are many parallels. I'll come back to this after giving it more thought and will do some reading as it's the 'early hours' here in Australia. Belle wrote: The innovations and developments we hear and see in those sonatas we hear and see in the symphonies - and, of course, other compositions in sonata form like his largest chamber works and the last 2 piano concertos. Quite so. Where I don't follow you is the notion that these innovations and developments somehow belong in symphonies and that their use in other kinds of music is therefore "symphonic." (If that's what you mean.) For me, they are Beethoven's way of thinking in all of his music, depending on what he happened to be composing - not just the few symphonies he wrote. Incidentally, it was not Beethoven who invented the extended and elaborate coda to end a movement. In this as in much else he was following Mozart's example, cf. the coda of the Jupiter Symphony's finale. Beethoven ended piano sonata finales in whatever form with long codas years before composing his first symphony - cf. the piano sonata op. 2 no. 3 whose rondo finale ends with a 50-bar coda, 1/6 of the whole movement. Even the scherzo of that sonata has a codetta (brief coda), as if a mere cadence wasn't enough really to complete the music. So I'd make an amendment to your comment, "For me it's as though he's working through these ideas for his symphonies during the process of composing the piano sonatas." That suggests the sonatas were just exercises, the symphonies are what really matters, and that's not right. Instead, I'd say he's working through these formal ideas for his music in general during the process of composing the piano sonatas, and not just the sonatas. Which of course is not what you want to say. Short forum messages aren't the ideal way to argue an unusual and controversial point of view. Good luck with it! I didn't mean to suggest that the Klaviersonaten were in any way inferior or merely a template for the symphonies et. al. But they provide a working 'fingerprint' of his musical thinking which informed the great works in other genres. I'll have more to say about it and do remember that Brendel wrote about this in one of his books, which I have on my shelf. In placing the Coda in a piano sonata Beethoven was innovating, since these had primarily appeared in symphonies up to that point. And because of this, and this others of his ideas, there's every reason to view these works 'narratively' - something one generally associates with the orchestra. Jordan Peterson says we learn to think by speaking and writing and I'm doing that right here!! These music boards have had a profound influence on my ability to think and write about music (in my 7th decade!). Belle wrote: In placing the Coda in a piano sonata Beethoven was innovating, since these had primarily appeared in symphonies up to that point. Is that really so? Off the top of my head, I would expect Mozart to have used the same formal and expressive devices in his quartets, quintets, and chamber music generally. (Not so much in his piano sonatas, which were generally more modest than Beethoven's.) I'll have to look into that. Beethoven wrote more piano sonatas than anything else, he produced them from the beginning of his career until nearly the end, and they're cast in an extraordinary variety of forms and effects and lengths and expressive modes. Charles Rosen says in his companion to Beethoven's piano sonatas that no two of them are really alike. (And I'd add that none of them is much like any of the symphonies.) It's not for nothing that in "The Classical Style," he focuses his discussion of Beethoven on the sonatas, with Haydn the focus of what he says about the symphony and string quartet. You say that the sonatas "provide a working 'fingerprint' of his musical thinking which informed the great works in other genres." If you mean no more by this than that Beethoven's music in all genres is consistent in style, as his style evolved throughout his career, well yes, of course. And that topic is more than big and interesting enough for just two lectures, even if (like Rosen) you choose to focus on just one or two genres, the piano sonatas and the symphonies. But if this isn't it, I guess I'll have to wait for you to tell us more about what you have in mind. "Beethoven's piano sonatas are unique in three respects: First, they represent the whole development of a genius from his beginnings to the threshold of the late quartets. There the Diabelli Variations and the last set of Bagatelles round out the picture. Secondly, there is hardly a work among them that is not worth playing - in contrast to many of the sets of variations, for example, which tend to be uneven...... Thirdly, Beethoven does not repeat himself in his sonatas; each work, each movement is a new organism". ('On Music; His Collected Essays, Alfred Brendel, p43). I know of no coda in a Mozart piano sonata. Perhaps you can tell me if you have found one. And there's the problem of 'coda' and what that precisely means; for some composers it might mean just a few add-on bars but for others like Beethoven something more dramatic, and with quite new material. Finally got around to this, and the very first movement of the first piece I listened to has a substantial coda with two surprises. It's Mozart's great string quintet K. 593. First, he returns to the music of the slow introduction, which he extends and develops. Then he launches into the beginning of the allegro again, as if he were going to repeat the whole movement - but no, he has something else in mind, and I'll leave it to you to listen and find out what it is. As I said, most of Mozart's piano sonatas are more modest, being intended for publication and home music-making, but there's at least one whose last movement ends with something like a coda in the form of a full-fledged cadenza as if it were a piano concerto. It's the sonata in B flat, K. 333. (Interestingly this was one of the few Mozart works that Horowitz played.) But previously you said only that before Beethoven, codas appeared in symphonies primarily, meaning not in other kinds of works, and I'm holding you to that. A coda is not implicitly symphonic, it can and does occur in other kinds of music, in Beethoven and earlier. It occurs to me that Mozart also anticipated Beethoven by beginning a piano sonata, the one with the Turkish rondo, K. 311, with a set of variations in andante tempo instead of the expected sonata form in allegro. But mostly he holds to the conventional pattern. I know, I know, your subject is Beethoven, not Mozart. But Beethoven was original enough in his own way not also to be credited for originality in what had already been done. His originality shows itself not in the existence of his codas but their occasional length and complexity, notably in the first movement of the Eroica and the last of the 8th symphony. Belle wrote: there's the problem of 'coda' and what that precisely means; for some composers it might mean just a few add-on bars but for others like Beethoven something more dramatic, and with quite new material. Last edited by John F on Mon Apr 09, 2018 7:28 am, edited 1 time in total. I'm going to download and print the music for the Mozart string quintet which you've posted; it's much easier for me to see AND hear. There is much to think about in what you've written. But I'll make some opening gambits then get back when I've processed the Coda issue further. Beethoven did compose increasingly "symphonically" from Piano Sonata Op. 7. These sonatas moved away from the classical models where the main drama had primarily been the interaction between tonic and dominant keys; tension and release. Though you may say none of these composers would have recognized the term "sonata form" or "sonata allegro form" Beethoven was right across the 'brief' with classical form and he well understood the basis of that 'drama', its 'tropes' and conventions. What he did was change the terms of the drama - substituting the Dominant for other more remote keys. But, his general direction was to move the emphasis and weight of the opening movements - which had been a mainstay in the classical era - towards the final movement/s. Ergo, the entire work was moving inexorably to a dramatic conclusion, just as in the symphonic form. Structurally the sonatas moved away from the three movement formula to 4-movements. Sometimes there were 2. There are introductions (as in Mozart) and these are re-iterated. In one of the sonatas (off the top of my head I cannot remember which one) the introductory material ends up briefly in the final section of the work. I'll see if I can find it. Dynamics, structure, shifting harmonic emphasis, delayed 'answers' to 'questions' and the manner in which the drama is played out are, IMO, hallmarks of Beethoven's 'symphonic' aesthetic in these sonatas. You'll see that while you were writing your comments, I was revising mine. The main difference is the last paragraph with its quotation from Rosen. I recommend his "Sonata Forms" to you, if you can get hold of it. As I said, 'symphonic' in scale and dimension - with the emphasis moving away from the opening movements of his earlier sonatas to the weight being shifted towards the final movements, dramatically and with a climax to all the preceding events there . This was a reversal of the classical paradigm where the emphasis was on the openings of sonatas - or the weight evenly distributed. The dynamic changes because of the piano's increased capabilities produced more symphonic 'colours' and these are reflected in Beethoven's sonatas; also the things I mentioned about scope and scale in my earlier posting. You just don't hear this in the piano sonatas of Haydn or Mozart - not anywhere near the extent of Beethoven. And as I also suggested Liszt's piano music has this 'symphonic' colouration. I do know that Schumann thought this way too because he wrote "Symphonic Etudes for Piano"; they are 'symphonic études' through the wealth and complexity of the colours evoked – the keyboard becomes an "orchestra" capable of blending, contrasting or superimposing different timbres" (that last sentence from Wiki). And Brendel writes about the 'orchestral' qualities of the piano in his writings. So, here it is not just about scope but actual colouration. The words 'orchestral' and 'symphonic' are rather interchangeable in some sense, but Beethoven's aesthetic was linked to his evolution as a symphonist. That's what I'll be discussing with regard to Beethoven's sonatas from about the middle period onwards in my upcoming presentation for our community music group. I know that's what you said, but as I said and say again, "If you believe you've already explained this, I'm sorry, but you haven't really." And your further comments don't make it any better. Since your mind is made up regardless, there's no point in trying to continue, and I'll let it go. We'll see what your audience thinks, or you'll see. Firstly, I'll let others reading this decide for themselves whether or not my two paragraphs in the preceding comments cover this and, secondly, I'm still reading and writing up my ideas. But I think primarily it's the scope, the emphasis on the last half of the sonatas, the colours and timbres Beethoven achieved from the piano through dynamics and the larger narrative arc that he achieved with his later sonatas that makes them 'symphonic'. I'm starting in depth with my reading and writing on this topic for my program in July. At the moment I'm revisiting this wonderful sonata, the Op. 13 "Pathetique" - and I must say this performance of it by Ashkenazy is doing it for me. I'm not usually an Ashkenazy fan, but the first two movements work well here - though the last movement is a tad too Mozartean for me: I'd like to see him let fly rather more!! The was the first piano sonata to use a slow introduction and it gives additional weight and gravity to the 3 movement sonata form - with an emphasis on the drama and questioning in the first two movements of the work; the reverse of what Beethoven did with his late-period sonatas. The second movement is slow, serene and unradical. It has uncommon beauty, reminiscent of Mozart; I feel this movement in some respects looks back K457. I believe we are starting to hear Beethoven working more 'symphonically' with this early period sonata - expanding the form with an Introduction and exploring the drama in the way that he did with his symphonies. More later. I just wanted to share the Ashkenazy performance. The first movement doesn't work for me. Ashkenazy had a reputation for being a bit of a 'basher' in his early days and it seems to be very evident here. The second and third movements are much better though the heavy hands do reappear in the finale. For me there are two Op 13s that work really well. One is Richter from a 1959 live Moscow performance. The other is from Moravec which I think is from 1964, recorded in NY along with the best Op 90 I've heard. I tend to agree with you about Ashkenazy's Beethoven, but his Rachmaninoff and Bach are quite fine in my book. Have you heard Russell Sherman, Brendel or Arrau in the Beethoven sonatas? IMHO, they are my top favorites. I've not heard Sherman. I have the first of Brendel's set of the '32 and like the approach he takes with most of it. For me, Arrau is hit and miss. His Op 111 is absolutely outstanding but other sonatas I've heard have been neither here nor there. That said, I have listened to all 32 by him. I agree about Ashkenazy's Rach - outstanding. In his younger years Ashkenazy was one of the finest Chopin pianists around. The LP recorded when he placed second in the Warsaw competition (Adam Harasiewicz was first), including the second concerto and some solo pieces, and Melodiya's complete recording of the Chopin etudes, are still tops for me. Later, after he left the Soviet Union, married, and settled in Iceland, it seems to me that his playing lost some of its special vitality and became, perhaps, a little complacent, and this affects all his Decca recordings except the first ones (of Mozart concertos). None of his Beethoven recordings show him at his one-time best. I have the first of Brendel's set of the '32 and like the approach he takes with most of it. Agreed, especially the last 3 sonatas. None of his Beethoven recordings show him at his one-time best. I have only 4 sonatas of his Beethoven, but do find his late 70's,early 80's (?) Decca of the "Tempest"( # 17, Op.31, # 2 ), and Opa.109 extraordinary. He and Perlman did a great job in the Prokofieff and Franck violin sonatas. I have that Melodiya Chopin Etudes recording and like you, it's my one of my top recording for the Etudes. This is a beautiful performance, Donald; thank you. The only works I have of Ashkenazy are one Mozart Piano Concerto (which I never listen to) and works by Chopin, so I was pleasantly surprised when I heard him on the "Pathetique" I posted. I'm presenting my program on the Beethoven Sonatas very soon and I've read that only one of them was publicly performed in Beethoven's lifetime. Does anybody know which one that was, and when? This will save me a lot of research and I'm running out of time. During Beethoven's lifetime there was no such thing as a solo piano recital, and he organized or took part in very few "academies" such as the concerts in which Mozart performed his piano concertos and improvised solo, sometimes extensively. I've read that it was Liszt who introduced the solo recital, and these featured not only his own music but others'. Beethoven, too, was celebrated for his improvisations, which would show off his virtuosity as both pianist and composer more emphatically than playing sonata movements or whole sonatas. He wrote these for publication and the income that would bring. Of course once a sonata was published, nothing would prevent some other pianist from playing it publicly, but I doubt it would have brought him/her much credit. Beethoven may have envisioned public performances of the Hammerklavier sonata - that could be why he provided metronome markings for it alone of his sonatas - and his pupil Carl Czerny may have played it complete, though whether or not in public I don't know. Czerny played the sonatas "at Prince Lichnowsky's palace once or twice a week, with the Prince calling out the desired opus numbers." (Wikipedia article on Czerny). But the "audience" would have consisted only of the Prince himself and his guests, if any. I've read most of this about Beethoven but it was only recently - perhaps in Brendel, maybe in Swafford, I can't remember - I read that there was one public performance of a Beethoven piano sonata. It didn't mention solo recitals because, as you said, these were the creations of Liszt; and it didn't say whether Beethoven had played the work himself. Tantalizing piece of half-information. I was left wanting more and didn't find it, thinking somebody here might know. And, of course, it begs the question of what is 'public'. (I'd like to be able to tell my audience of 45 music enthusiasts on Thursday week.) When I first read that comment I put it into the context of Beethoven's Sonatas being composed for aristocratic entertainments and for publication. I looked further, in Lewis Lockwood's biography (the most recent and best in English) and the detailed chronology in "The Beethoven Compendium." Neither mentions any such performance, and they would if it happened. So the answer is "not as far as is known." Czerny played the public premiere of one of the op. 102 cello sonatas, and some other chamber works received public performances (some quartets, the septet), but apparently none of the sonatas. Thanks so much for taking the trouble. Much appreciated. I will get hold of that Lewis Lockwood biography; don't want to miss out on reading a single book about Beethoven! I've been re-reading sections of the Swafford, "Beethoven: Anguish and Triumph" - which is beautifully written. Also I'm reading Dr. Niall Ferguson's "The Square and the Tower". Dr. Ferguson discusses the Illuminati and there it is, formulated by a particular group, right in Bonn at the time Beethoven was about 10. Excellent piece of symmetry. As to the nature of a public performance, I'd say it would be any performance for which admission was not exclusively by invitation but open, though it could be either paid or free. The premiere of Beethoven's Eroica symphony was private, in Prince Lobkowitz's palace; the first public performance was nearly a year later at the Theater an der Wien. That looks very interesting and I hadn't heard of it. There's a circulating copy at the Performing Arts Library, so I'll have a look. Thanks for the post. P.S. It's signed out or missing, so I'll just buy it. Copies are available from amazon.com cheap. There's contradictory evidence on Beethoven's attitude toward tempo. First, his metronome marks are not as definitive as might be wished. At the beginning of his manuscript of the 9th symphony he wrote, "108 or 120 Malzel," a very wide range, while in the printed edition the mm is 88. Carl Czerny, who in his younger years studied many of the piano sonatas with Beethoven, provides different metronome marks from Schindler, Beethoven's amanuensis in later years, and Czerny's vary over time. Schindler's biography of Beethoven is full of questionable stuff but since he knew Beethoven well, I wouldn't dismiss all his comments on performance. There's contradictory evidence on Beethoven's attitude toward tempo. Indeed , and egads ! Thanks very much for posting this. Streets ahead of other music messageboards - in every way. I hope to post some more when the library comes up with the Drake book. What's the date of your lecture? Speculation that Beethoven's metronome may not have worked properly has been going on for many years. Another possibility which I've read somewhere is that when playing music in your head (as opposed to with your fingers), you naturally tend to race ahead, as indeed I do; if Beethoven had based his metronome marks for the Hammerklavier Sonata on his own attempts to play it (deaf as he was), as opposed to just thinking it, they might have been more realistic. My lecture is on Thursday, 2nd August AEST. The issues of tempo markings is worthwhile discussing as part of the way we hear the music today compared to how Beethoven or his friends might have played/heard it. And, of course, the matter of the modern Steinway compared to the Beethoven pianos. Meanwhile, you might find it worthwhile to read Charles Rosen's "Beethoven's Piano Sonatas: A Short Companion." Yes, Charles Rosen again; I cite him repeatedly because, as a major pianist as well as a major scholar and critic, he writes from a depth of knowledge and experience that speaks to me. "As the Allegretto is in alla breve measure, the whole must be played a remarkably quick Allegro molto. The beautiful, expressive, and extremely melodious theme, must be played as cantabile as possible." "Did Beethoven really have such a limited, schoolmaster-like notion of the alla breve measure that he would establish it, or any time signature, as the first law in interpreting a piece of music, rather than the particular character of the music itself? He himself played this rondo, and would have played it, 'at a comfortable pace.' The whole movement has much the character of a quiet narrative." It seems to me that Schindler is right about the character of the music (although his claim to have heard the composer play it may be doubted, as he had a tendency to lie about such matters with complete effrontery). Charles Rosen wrote: Originally a relatively simple Andante con moto in manuscript, it was changed and published as Andante con moto quasi allegretto moderato ma non troppo vivace, the marking of a composer almost paranoid with the certainty that the performers will get it wrong (as they mostly do). Good reading, then, if you can find a copy. Thanks, John, for that recommendation and the quotes. I have Rosen's "Classical Style" on my shelf and have spoken negatively about this in the past (as you know) and I have "The Romantic Generation" - as yet unread. The issue of Beethoven's tempo markings will be subordinate to central to my discussion - just one aspect of fidelity to scores etc. I intend concentrate on the Sonatas themselves and how Beethoven 'interrogated' the classical forms, making structures all of his own. I was discussing this issue of tempi with my musical co-convener yesterday and he reminded me that one of the academics we have as a guest lecturer from time to time has specialized in this area - but not simply confined to Beethoven. The university library will have the book you've referred to should I need it. I've focused on tempo because it was of central importance to Beethoven, as he said. On the manuscript of the song "Nord oder Süd" he wrote, "100 according to Mälzel, but this must be considered applicable only to the first bars, for sentiment [i.e. feeling, emotion] also has its own tempo and cannot be completely expressed by this number." So the modern literalism in interpretation goes against Beethoven's theory and, according to both Czerny and Schindler, his practice. Other chapter topics in Rosen's book include "Formal Principles," "Phrasing," and "Pedal, Trills, Extending the Keyboard," before going into the sonatas in chronological order. Whether any of this will be helpful to you in preparing your lecture, I don't know, as I don't know what you expect to say. But to anyone going into Beethoven's piano sonatas in any depth, Rosen's is one of two books I'd strongly recommend; the other is D.F. Tovey's "Companion to Beethoven's Pianoforte Sonatas." I don't remember what your specific problem with "The Classical Style" might be, and am puzzled. The only complaint I've seen or heard about it from anybody else is that it's too technical for some amateurs, while the praise (from those who can understand the level of the discussion) has been pretty much universal. But that's beside the point just now and there's no need to go into it. Your points are well noted and I thank you for them. I have time constraints and with the fact of 32 sonatas and only 5 hours for discussion (total of the two lectures) it's been challenging deciding which to include; it's still not settled yet and time is running out. My second lecture is in October. I want to concentrate on how Beethoven shaped the sonata, what that form actually means (if anything specific under his hand) and I want to demonstrate with particular sonatas where Beethoven 'interrogated' the form, using specific examples. I'll be following with my G. Henle Verlag scores to stop, identify, discuss individual sections and then take Q&A - for which I absolutely must be prepared. Yesterday we had a jazz enthusiast who plays the E Flat Clarinet and who visits New Orleans every year (has done since 1984) and plays in those funeral processions so beloved of African Americans in that city; indeed he was often the only white musician in the band. We heard recordings of the music, as well as watching U-Tube footage of him playing with them. A friend drove me to the station afterwards and observed, "I don't like this stuff; I want music which is actually going somewhere!" Hardly anyone turned up for it yesterday, so I'm assuming others feel the same. But I expect a full house next week for Beethoven!!! I'll comment further about Rosen later (with examples) when I'm not time-poor. I'm reading a chapter on Beethoven in Rosen's "The Classical Style" and instantly I come across the sort of thing which annoys me about Rosen. On page 385 he talks about Beethoven's substitution of the mediant and sub-mediant for the dominant, which creates drama through newly defined expectation (that last phrase was my own interpretation). Then he writes, "That Beethoven's musical language remained essentially classical - or, better, that he started with a late and diluted version of classicism (what the hell does that mean?) and gradually returned to the stricter and more concise form of Haydn and Mozart (his style was nothing like Haydn or Mozart in those late, great sonatas but, if it had to be, it would have been the former and not the latter) - does not mean that he stood outside his time (well, yes he did), or that his conception of classical form was the expression of an outlook identical to the late 18th century's (Rosen is having an each-way bet!). To cite only one trait (oh, please do! ), his music often has a sententious moral earnestness that many people (?) have found repellent (that's not a word I've ever heard associated with Beethoven! )...on and on with other sweeping generalizations not fleshed out!! And as for "sententious moral earnestness" I presume Rosen is also referring to the lively and humorous Scherzo heard below: and please do note the glorious Menuetto and the 'sententious moral earnestness' of the final movement!! The analysis isn't particularly difficult in the Rosen; what is difficult is the passing comments and generalizations which are never proven or developed. Not all the time, to be sure, but enough to do my head in!! I shouldn't have to believe something because Rosen says it; he has to prove it to me. Sorry, but there it is. Charles Rosen wrote: In fact, with age, Beethoven drew closer to the forms and proportions of Haydn and Mozart. In his youthful works, the imitation of his two great precursors is largely exterior; in technique and even in spirit, he is at the beginning of his career often closer to Hummel, Weber, and to the later works of Clementi than to Haydn and Mozart. As to the essence of the Classical style, the whole of Rosen's book is his answer to that question. I've no doubt that Rosen "fleshes out" the other observations you object to (actually I agree with them), and I can look for the fuller explanations if you'd care to have them. Otherwise I'm not going to hunt through a 500-page book for the paragraph that does the job. As for Beethoven's moral earnestness, that's surely beyond question. He disapproved of "Don Giovanni" and "Così fan tutte" as immoral or frivolous; his own opera "Fidelio" is their opposite, exemplifying fidelity in love - heroic marital fidelity at that - which those Mozart operas flout and even debunk. Beyond the choice of subject and the libretto, Beethoven writes heroic music for the heroes and villainous music for the villain; Mozart's music pokes fun at his villains (Osmin, Monostatos), is ambiguous (Queen of the Night), or actually celebrates their antiheroism (Don Giovanni), while "The Marriage of Figaro" is, among other things, about a broken marriage. In his private life Mozart was as morally serious as anyone, including Beethoven, but he was also realistic about human nature, not puritanical like Beethoven. Of course there are points on which I disagree with Rosen, and some on which I believe he may be mistaken. Nobody's perfect. When that happens, I just move on, I don't dismiss the whole book or his whole oeuvre. Of course, I take all your points. But many readers will choose selective chapters, depending on the nature of their research - not necessarily wanting to read the entire book. This is a structural problem which required a ruthless editor, in my opinion, and I think it considerably weakens the text. And the 'moral earnestness' statement should have discussed specific examples; it really is that simple. I don't find one single Beethoven piano sonata (mostly all 32 of them containing his DNA as a developing composer) to be 'sententious' or 'morally earnest'. I totally disagree with any similarity between Beethoven's late works and either Haydn or Mozart. All used 'motivic development' as a foundation principle for their 'classical' art, but that's where the similarity ends. Alfred Brendel refers to what Beethoven does as 'foreshortening'. May I recommend the Curtis Institute's online "Coursera" on the Beethoven Sonatas. Dr. Jonathon Biss tells a different story to Charles Rosen, though he does quote Rosen from time to time - most significantly in his 'definition' of sonata form. Reading Brendel's "On Music" we find a different way of thinking about Beethoven's art in relation to classicism, its identifying features and those smaller units of music developing into bigger ideas. "The concentration of materials in the "Hammerklavier" Sonata Op. 106 is perhaps even more astonishing. Everything in this gigantic work seems to be related to the interval of the third; the construction of the themes as well as the most important tonalities of the work are all based on this interval. Charles Rosen has pointed out how the harmonies in sections of the first movement, as well as in the development of the Adagio, progress through a series of descending thirds. In the Adagio, we find no fewer than 65 progressions by a third, along with another 20 in the Largo introduction to the fugue. From such examples, it is easy to see that the motifs binding a work do not establish the character of that work. The character (or characters) of the "Hammerklavier" obviously cannot be derived from the interval of a third. Motifs can contribute substantially to the unity of a work, but they usually do this in an abstract sense. But musical expression.....is not dependent on motifs or constellations of motifs. Rather, expression makes use of them......It is the interpreter's responsibility to play the roles of different characters. Like very person, it would seem, every sonata has distinct qualities and potentialities. Each character lives and breathes as a sum of its attributes" (pp.70,71). I've got a question. Can anybody help, please? My G. Henle Verlag score of Beethoven's Op. 2/1 has a repeat marking at the end of the first movement back to Bar 19 (the development). That doesn't seem to be observed in any of the recordings or the analyses I've encountered. Can anybody tell me, therefore, why that repeat is there in the score? The repeat is in the score because Beethoven put it there. Henle bills its edition as Urtext, which if it means anything (sometimes it doesn't) promises a faithful reproduction of the original sources. Whether or not to take repeats in sonata form movements is up to the performer and, on recordings, the record company. Until 1980 or so, repeats were rarely taken on records or in concert, and while the exposition repeat is fairly often taken nowadays, the repeat of the second half of the movement (development and recapitulation) is much more rare except in self-consciously HIP versions. There are times when the composer has created an effect that is spoiled or lost when the second-half repeat isn't taken. One of these is the finale of Mozart's Symphony #39, which ends with a Haydnesque joke which is set up when the closing bars link back to the opening of the development. At other times I don't mind omitting the repeats or even prefer it. Instead of hearing the same music twice, I'd like to hear other music. In Beethoven's op. 2 no. 1 I think the first movement repeats are merely conventional, Beethoven makes nothing special of them, so I'd just as soon move on to the Adagio. And I take yours. If you don't find Rosen's way of thinking useful or persuasive, that's that. Of course if one has a different conception of the Classical style than Rosen's, and wants to consider Beethoven as a Romantic breaking all the Classical rules (as some of his contemporaries did), one has plenty of company. But from our perspective 200 years later, it looks different than it did in the early 19th century. At least it does to me. Charles Rosen's complete Columbia and Epic recordings were recently reissued on CD, and they are very informative to the musical mind, if you can still find a copy somewhere. Rosen's playing is not up to the technical demands of the Beethoven Op. 111, for example, but in other works he's crystal clear and very satisfying. I would not rank him as a great pianist (like Brendel, who also both played and wrote about music), but Rosen is very appealing and warm in his manner and tone quality. Good luck with your lecture, Belle. 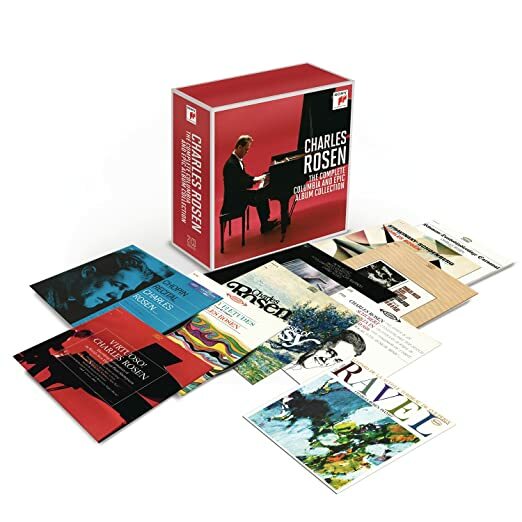 As a pianist, Rosen will be remembered chiefly for his performances and recordings of difficult modern and contemporary music. I expect these are well represented in the new set, though they may be the least listened to in the box. Boulez sonatas anyone? Rosen may not have been a great pianist according to conventional expectations, but he was certainly an important one. My Kalmus Edition (likewise Urtext) also has the repeat of the development and recapitulation in the first movement. Beethoven repeats these sections in the fourth movement of Op. 2/1 as well. Richard Goode's recording observes the repeat in the first movement but not the one in the fourth. The first movement ends with a sort of "that's it" finality that might make the repeat sound out of place. Perhaps the key is the fermata over the rest on the last beat of the measure, as if Beethoven is asking for the music to die down a bit before going back. If you wait long enough, it could even be taken as a musical joke of sorts as in "I can't believe he's doing that." BTW, Op.2/2 also has a development and recapitulation repeat in the first movement. Goode doesn't take the repeat this time.